R94147 Richell Wooden Freestanding Pet Gate High Large (HL) in Autumn Matte or White is designed to fit Doorway or Hallway Openings from 39.4-inch to 70.9-inch wide. Recommended for Small To Medium Dogs 6.5 To 33 Lbs (3-15 Kg). 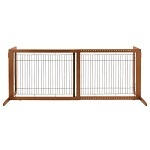 Like Richell's Original Freestanding Pet Gates, The HL has the same Special Features to keep your pet safely confined. Place it anywhere you need it, any time. Side panels are designed to keep the gate from tipping over, plus the rubber feet keep it from sliding. Side panels fold in for easy storage or transport. The beautiful hardwood construction complements Richell's other fine wood pet products!